Cortana Helper Tool is a very simple portable tool that helps you to reset Cortana settings. An effective tool to fix Cortana restrictions "Cortana is disabled by company policy" and "Online Search is disabled by company policy". The usage is simple, open the program, click "Reset Cortana", and restart your PC, that's all. We have included some special options to customize Cortana functionality (so also experienced users can enjoy this application). Tested on Windows 10 Home, Pro and Enterprise, 32\64-bit. No installation is required to use this tool. Despite the fact that it is one of the most useful and noticeable additions to Windows 10, dealing with a non-functional Cortana is not only frustrating, but it can considerably decrease the overall performance of your system as well. 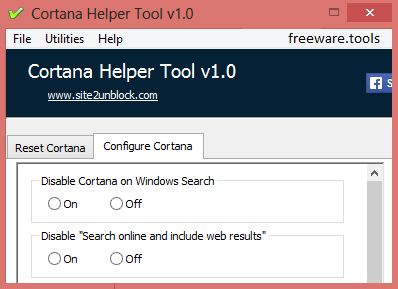 Cortana Helper Tool Portable is an application that enables you to correct functionality issues associated with the personal assistant and consequentially, boost your productivity. First off, before you do anything else, you should verify that the personal assistant is available in your country. In the eventuality it is not and you want to add it to your system, then you could consider performing some tweaks in the regional settings. The other notable culprits for this issue is that the assistant is blocked by the firewall and your Microsoft account. Irrespective of the reasons why Cortana is not available on your operating system, the good news is that you can remedy the situation with the application. The tool enables you to reset and correct all previous configurations and you can start using your personal assistant as soon as you restart your computer. Although the primary roles entail fixing bugs associated with Cortana, you should know that the application also includes an extra set of tools that you might find useful. Therefore, if you want to open the UAC settings, hosts files, Windows services, learning more about your system or perform a disk cleanup, you can seamlessly do so by accessing the Utilities menu. As far as configurations are concerned, you can specify if you would like to disable the personal assistant when performing searches on Windows or online. Moreover, you can disable the function that enables Cortana to use your current location when performing a query. All in all, Cortana Helper Tool Portable might be just the program you need to correct the common bugs that prevent you from making the most out of having a personal assistant.